Skateboarding Attitude: Not What It Used To Be. It is not surprising that skateboarding attitude has has bad name. Skateboarders are teenagers and teens have a rep for acting out. So many people have thought of skaters as criminals. The icon in the 80's was a bad skater. A few bad apples got the attention. Today most skaters are kids who want to have fun. They like skateboarding and they do it for fun. That's all. I worked in a government office a few years back. I was the guy to go to if people needed help with spreadsheets and computer stuff like that. They knew I was good at what I did. Once while working on a project with an older staff I got a rather weird comment. He said asked me: You are a skateboarder right? He replied: How did you stay out of jail long enough to get this job? I am pretty sure he was just making jokes with me but it drives home a point. Most people over the age of 40 think of skateboarders as criminals. So why is that? We need to look at the way skateboarding appears to those who don't do it. It seems that the older you are the less likely you are to think positively about the sport. That's what it is, a sport. To many it is a way of life but to most it is an activity. Teens hanging out in public looking like they are up to no good. Many people are intimidated by teens. Skateboarding happens in public spaces and people see it. They look at skaters and hold a bad view of them. The bad kids hang around where the skateboarding happens because it is interesting. When they get bored they break laws and leave messes. Then skaters get blamed. This has ruined so many good places to skate. It's the non skaters that cause problems and then the skaters get kicked out. 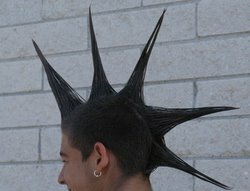 In the 80's a relation with skateboarding and punk rock was promoted. The rebel mixed with the activity of skateboarding. The idea stuck. Question: You skate, aren't you into punk rock? Reply: I was too busy skateboarding. Skateboarding often damages property. This is true. Skateboarding leaves marks on some property. There are solutions to this problem like providing good places to do the activity. Skateboarding is loud and it sounds like things getting smashed. This is true too. I say get over it! Basketball is loud too. Private property owners don't want skaters hanging around. They don't want damage, messes or injuries on their property. When people tell teens to leave they usually get attitude. Thats just teens. Again there are solutions to this problem like providing good places to do the activity. Some Think The World Owe's Them Something. There are some older skaters. Many who think that because they have skateboarded for 25 years or more. They deserve something from all other skaters. They think that since they stuck with skateboarding even when it wasn't popular. That now skateboarding owe's them good opportunities, great places to skate and respect. They say: "Back in the day we were real skaters". They hate the success of skateboarding. The video games, X-Games, Olympics and skate shops in the mall. This is a bad skateboarding attitude. I say: "Progress for skateboarding is great!" The bigger skateboarding gets the better! Growth means having to keep up with your competition. This brings the quality to the top for most skaters. The cream rises. Skateboard companies and shops prosper when they provide what skaters want. I have skated for a long time. Longer then many skaters now have even been alive. I do it for one reason and one reason only. I do not believe skateboarding owe's me anything. I want to contribute and be a part of the success of skateboarding. Young Skateboarding Attitude is so Upbeat. It is much easier to find skateboards and find places to skate these days an all the skateparks. The level of skateboarding has become so amazing too. Kids today are just having fun. They aren't a part of the counter culture. They are the culture! "Dude you have no Qur'an!" 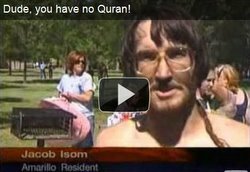 The Armadillo Texas skateboarder who saved the Qur'an from burning on September 11th 2010. Is a hero to me. He stood up for what he believed in. The media latched on to his rebellious skateboarding attitude. I think he had the positive attitude to stand up for freedom and all the things that make society good. If that gets headlines then I am okay with that. This skateboarding attitude is what makes me happy. To be a part of such an interesting crowd as skateboarders. Skateboarders are a Mainstream Group with a Bad Rep. This bad reputation is a remnant from the past. Most skaters are no different than any other kids or athlete. They love what they are doing and have fun while doing it. Forget the stereotype, it does not fit any more. The out dated image of skaters as criminals is a thing of the past. Nowadays it is the positive skateboarding attitude that rules.